How much progress one can make by just knitting for an hour or two. 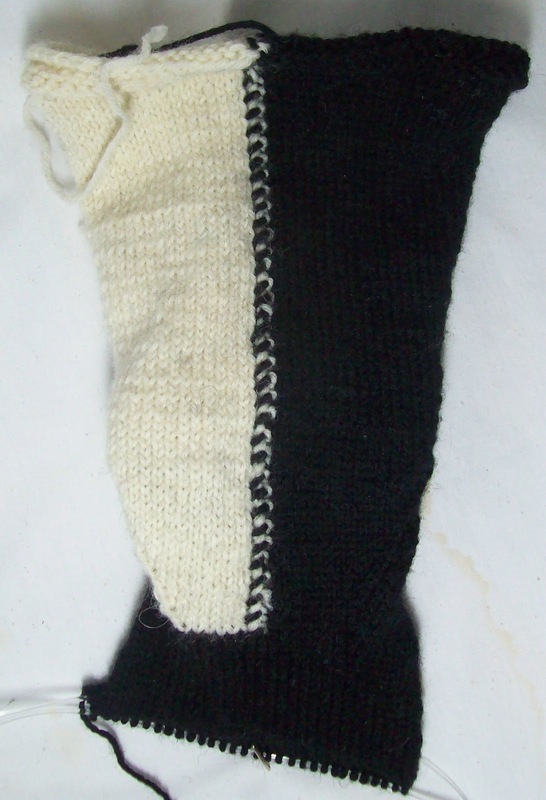 Here are the socks again—back on 2 circ's, not 4. 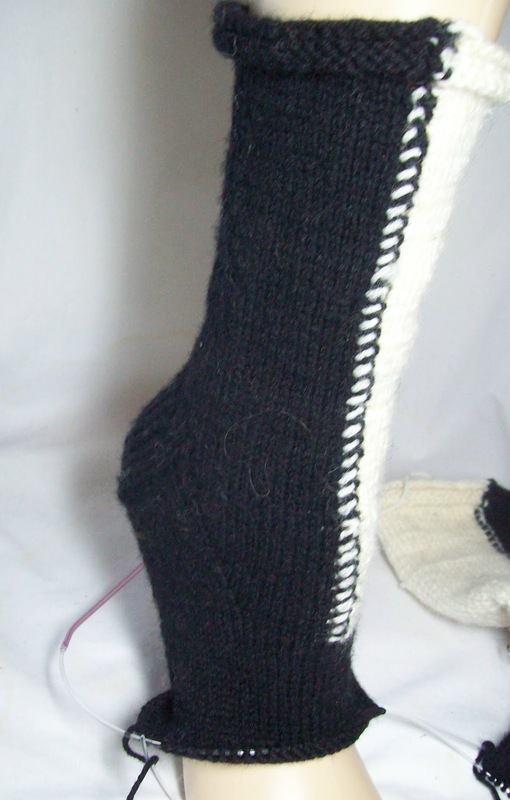 Second gusset completed, and with 2 inches of the foot knit. Another inch and half, and it will be time to start the toe shaping. There is still a lot of finishing to do—One sock still needs the back seam sewn, and both socks have a fair number of ends to be woven in. But that will be quick work on Sunday at a local knitting group. I am already thinking about which sock to do next. Right now, I my thoughts go to a very simple generic pair of a self striping wool. With a bit of fanciness at the cast on edge, and nothing but self patterning to keep it interesting. My secrets sock --my goal was to do one regular (public) pair and one secret pair a month--(and obviously I am behind schedule!) will be a simple pair too! Later today, I will be hand painting the remaining white wool--each skein is just under 40g--almost enough to make a pair of socks (for me). While I work, I will be making a photo essay about my process. It's really not that hard to do hand painted skeins—if you do them one skein at a time, and don't need to produce a number of skeins with near identical results--as you would for a commercial (even a small scale commercial) enterprise. I am not interested in doing hand painting or custom dye work on any sort of scale and selling the results—I am just doing it for me. It's another way to be creative (and frugal!). I get the best of both worlds—basic yarn (Paton's Kroy) bought at less than full price, hand painted to make one of kind art yarn. I have had “failures” (that is not gotten the desired results, exactly) but none of my failures have been real fails. The results are always workable—and sometimes really quite lovely—even if not the colors or effects I was not exactly what I was going for. My other project for today (knitting will be put off till tonight) will be some sewing. All this week at odd times, I have been ripping (frogging?) seams on clothes. Some are silks (worthwhile to alter!) some are just cottons (but colors I really like), and now its time to take in the seams, add new elastic to the waist bands and make them into smaller clothing. Size 3X is becoming size 1X or in some cases, size L. Later this spring, I will head to my favorite thrift store, and see if I can find some new (to me) clothes, too. And some of the way to big, and just not worth altering clothes will be donated at the same time.